We’d love your help. Let us know what’s wrong with this preview of The Magician's Assistant by Ann Patchett. To ask other readers questions about The Magician's Assistant, please sign up. I really enjoy this author i.e. Patron saint of liars, etc BUT this one was really hard for me. It kept dragging on and I couldn't help not liking Sabine. She was wishy washy and her whole woe is me act got old fast. Anyone else? It was a chore to finish this book. I know you are thinking, is there a book you don't like, Laura? Here's the deal. If I don't like a book I can barely read it, much less finish it. So if I do read it-I like it, in varying degrees, but I like it. So tonight I read the Magician's Assistant, by Ann Patchett. If you have read Bel Canto, (and you should have, though I'm not sure I'm spelling it right at the moment. )then you know her style. You get hypnotised by the story, by the language, you get into this rhythm that you can't break I know you are thinking, is there a book you don't like, Laura? Here's the deal. If I don't like a book I can barely read it, much less finish it. So if I do read it-I like it, in varying degrees, but I like it. So tonight I read the Magician's Assistant, by Ann Patchett. If you have read Bel Canto, (and you should have, though I'm not sure I'm spelling it right at the moment. )then you know her style. You get hypnotised by the story, by the language, you get into this rhythm that you can't break until you finish it, so you keep reading and reading until it is 12:15 in the am and you are finally done, but then you can't believe it ends. What!! Ends!! You are not ready, but there you have it. You sit there for a while, because you're thinking if you open the book again, you will have found that you missed a chapter, that there is MORE. Is this really Ann Patchett? While the story was mildly intriguing, I couldn't really like the main character. Sabine seemed too satisfied with living a half-life (in love with a gay man, an assistant instead of a magician, a maker of architectural models rather than an architect, etc.). The literary symbolism also seemed clumsy and obvious (last name Fetters, for example). Finally, and most annoying to me as I live here, the ridiculous caricature of Midwesterners made me want to scream. COME ON Is this really Ann Patchett? While the story was mildly intriguing, I couldn't really like the main character. Sabine seemed too satisfied with living a half-life (in love with a gay man, an assistant instead of a magician, a maker of architectural models rather than an architect, etc.). The literary symbolism also seemed clumsy and obvious (last name Fetters, for example). Finally, and most annoying to me as I live here, the ridiculous caricature of Midwesterners made me want to scream. COME ON - the landscape is not all flat, the kitchens aren't decorated with roosters, and husbands are not wifebeaters or mild nerds. I flipped to the back cover to read the author bio. The first sentence: Ann Patchett lives in Los Angeles...no kidding! This book surprised me. Throughout the whole thing, I was never exactly sure how much I was enjoying it, and yet I couldn't wait to pick the book back up and continue reading. By time the book was done, I wanted to read more, and wanted the story to continue. The story itself is strange, very strange, but it draws you in immediately. It's the story of a woman named Sabine who is coming to terms with exploring the hidden past of her husband, a famous gay magician after his death. You wonder how th This book surprised me. Throughout the whole thing, I was never exactly sure how much I was enjoying it, and yet I couldn't wait to pick the book back up and continue reading. By time the book was done, I wanted to read more, and wanted the story to continue. The story itself is strange, very strange, but it draws you in immediately. It's the story of a woman named Sabine who is coming to terms with exploring the hidden past of her husband, a famous gay magician after his death. You wonder how this story is going to work, which is the beauty of how well it draws you in. It's a beautiful example of story-telling, and the writing is flowing and enticing. A few problems: A lack of chapters. I know this is a clear choice of style, but I found it really hard to be able to start the book up again after putting it down for the night, so the book that was meant to flow so perfectly ended up being a bit choppy because there was never a good place to stop and think. Also the ending was very... abrupt, and unsatisfying. This is my second Patchett novel, and I liked it even less than the previous one I read ( State of Wonder ). First, I totally misunderstood the premise of this novel. I thought our heroine Sabine's lovely hottie magician husband dies, and then she discovers he was secretly gay, and then discovers he lied about his family being dead and seeks them out blah blah. Instead, the story is that Sabine's lovely hottie magician husband is openly gay and only marries her in the last year so she may inherit This is my second Patchett novel, and I liked it even less than the previous one I read ( State of Wonder ). First, I totally misunderstood the premise of this novel. I thought our heroine Sabine's lovely hottie magician husband dies, and then she discovers he was secretly gay, and then discovers he lied about his family being dead and seeks them out blah blah. Instead, the story is that Sabine's lovely hottie magician husband is openly gay and only marries her in the last year so she may inherit his things. He's had numerous loves despite her affection for him. When he dies, she discovers his family isn't dead and seeks them out blah blah. Slight difference, but a significant one: it put the idea of knowing more on Sabine. She knew who Parsifal was, to a point -- she'd been his assistant for 20 years -- so I found her behavior in this book to be a bit piteous and aggravating. Disappointingly, rather than explore the source of her mental and emotional stasis, Patchett has Sabine pursue Parsifal's life -- yet another obsessive step into the life of a man who didn't love her like she loved him. Since I wasn't fixated on Parsifal the way Sabine was, this whole journey didn't capture me. That Sabine seemed to have little emotional growth and development along the way -- other than to glom onto one of Parsifal's relatives -- frustrated me, but I'm not sure that was the intent of Patchett's story. I think we were supposed to like and relate to Sabine but I found her in need of therapy and some time alone to think about who she is and what she wants from her life. My next complaint is a little harder to articulate, but there was something dated, I guess, about the novel's feel regarding gays. In some ways, that makes sense -- this book came out in 1997, nearly twenty years ago -- but at the same time, I feel like there's an artificial sense of shock and surprise created by Patchett to evoke tension, maybe. I'll have to meditate on this more as I know I'm not expressing myself clearly -- while reading this, I found myself venting to my wife about how all the Midwestern gays I know (even the ones not speaking to their families) had a more layered relationship to their kin than Patchett's imagining. And on to my final complaint about this book: I wasn't wild about Patchett's use of setting. In State of Wonder, I thought she evoked the Amazon beautifully, magically. In this book, I found her articulation of Nebraska and the Midwest to be little more than caricature. I suppose since I've lived in Nebraska and the Midwest for a good chunk of my life (and not the Amazon), I cared more, but I felt Patchett used stereotypical shorthand to paint the setting -- country kitsch decor, Walmart, brutish spouses -- rather than really evoke the beauty of a place that moves, lives, and breathes differently than L.A. The writing is very Patchett-ian, I would say. I read a review about this book describing its "...dreams, flashbacks, and long, elliptical conversations..." which is spot on, and made me insane. I'm not wild about dream sequences in books; I find them a bit self-indulgent and pointless. Perhaps if I liked Sabine more, that element would have resonated, but since I didn't, I felt tired -- I kept putting this one down rather than wallow in the linguistic snakiness. I enjoyed reading the book, but after reading it I couldn't say that I loved it (hence, three stars). Sabine, the main character, spends time with her dead husband's family, none of whom she knew existed. The reader is supposed to come along on the journey with her to discover the missing parts of her longtime friend/spouse, but I didn't gain any new insights to him from her visit back to his roots. The West Coast magician reinvented himself too well to have any connection to the Midwestern teen I enjoyed reading the book, but after reading it I couldn't say that I loved it (hence, three stars). Sabine, the main character, spends time with her dead husband's family, none of whom she knew existed. The reader is supposed to come along on the journey with her to discover the missing parts of her longtime friend/spouse, but I didn't gain any new insights to him from her visit back to his roots. The West Coast magician reinvented himself too well to have any connection to the Midwestern teenager (by the way, the Midwest is NOT as bleak and backward as portrayed in the book--the stereotypes were obnoxious). After a traumatic childhood, he left town and ended up with love and friendship and happiness. Ta-da. But, the novel is called The Magician's Assistant, and really is about Sabine's search for...something (I'm from the Midwest and not "with it" enough to figure out what). I just hope she found it because I never quite understood her living a half-life and found her contentment in always serving as the second banana tiresome. My best description of the novel, after reading it, was that I felt like I was eavesdropping on someone else's conversation: I wasn't in earshot for the beginning and didn't get to hear the end, but it helped pass the time while I was sitting there. I have really become an admirer of Patchett’s writing, and this book was a close second to Bel Canto, which I adored. The Magician’s Assistant is Sabine, and she is mourning the sudden loss of her husband, Parsifal. But the story goes deeper than that. Parsifal is gay, and shortly after the death of his lover, Phan, he marries Sabine to ensure her security in the event of his death. Sabine had been Parsifal’s long-time assistant in his magic act, but more importantly, they shared a bond of frien I have really become an admirer of Patchett’s writing, and this book was a close second to Bel Canto, which I adored. The Magician’s Assistant is Sabine, and she is mourning the sudden loss of her husband, Parsifal. But the story goes deeper than that. Parsifal is gay, and shortly after the death of his lover, Phan, he marries Sabine to ensure her security in the event of his death. Sabine had been Parsifal’s long-time assistant in his magic act, but more importantly, they shared a bond of friendship that was unbreakable. When Parsifal’s lawyer notifies Sabine that he had a family (who he claimed were dead) and that his name is really Guy Fetters, Sabine’s world gets turned on its head. Suddenly, the man she though she knew most in the world is a stranger to her, and she wants to learn everything about his past that he has kept from her. So the Fetter family enters Sabine’s life, and the book follows the development of these new relationships seamlessly. There is a hint of magic in Patchett’s writing, and not just the tricks and illusions she recalls in The Magician’s Assistant. She writes relationships and dialogue in a manner that seems effortless. Her characters are entirely human – flawed and lovable. This was a great read and a touch of magic amongst the ordinary. I found the trio of Sabine, Parsifal and Phan all too good, too unflawed, too beautiful, and Sabine's adoration of Parsifal for 22 years was a little hard to fathom. There was apparently no heartache, no discord. In addition, Sabine had been so in love with the glamorous, gay Parsifal that she had failed to realize that she was really gay herself, and thus her attraction to Kitty at the end. That was a bit of a stretch--this beautiful, personable, intelligent, talented woman did not have a clue about her own sexual orientation. She was not living “apart” from the gay world after all. Other aspects that were too idealized: Sabine’s relationship with her parents and what it’s like living in L.A. The ending was odd. There was obvious foreshadowing, which went on for too long. Kitty and her boys need to move to L.A. and move in with Sabine. The reader figures out this is where things are heading. Sabine finally realizes she should ask them to move to L.A. That’s fine, but the novel then ends abruptly. It’s not that the reader needed to know exactly whether they would move to L.A. It’s that the ending has to be satisfying. I did like reading about a magician's life, having known little about this before, and I did like the way Patchett used dreams in this novel to advance the story or add information that would have been hard to introduce otherwise. They weren't your usual dreams, but more like dialogues with the dead--well, mainly Sabine and Phan, leading up to Parsifal's appearance at the end. The dreams put the reader in touch with Sabine’s grief and how the grief changes slowly over time. I enjoyed the way Parsifal’s mysterious past was gradually revealed. The writing is superb. One pitch-perfect sentence after another kept me hooked. I’m remembering the decriptions about magic tricks, and the times Sabine did some tricks for her “new family”. I felt like I was there. I could see the family watching the same Johnny Carson segment every night. That was also a good device for advancing the story and showing the way grief slowly changed. The narration for the recorded book was excellent. Dot, the mother/grandmother, was fabulous. Her character came alive. Descriptions of the cold and snow in Nebraska were unforgettable. The portrayal of small town life was realistic. It is rare to find a literary page-turner, but Ann Patchett never fails to give us exactly that. Her writing is elegant, sophisticated and quiet; it never gets in the way of the story. The closer I got to the end of this book, the more obsessed I became with it, wanting to make sure that everyone was going to be okay, at least in some sense of the word. The Magician's Assistant follows the same pattern of Patchett's other novels: An unsuspecting character is thrust into a world full of people he It is rare to find a literary page-turner, but Ann Patchett never fails to give us exactly that. Her writing is elegant, sophisticated and quiet; it never gets in the way of the story. The closer I got to the end of this book, the more obsessed I became with it, wanting to make sure that everyone was going to be okay, at least in some sense of the word. The Magician's Assistant follows the same pattern of Patchett's other novels: An unsuspecting character is thrust into a world full of people he/she never even dreamed of, replete with drama and emotion and confusion—as well as hope and love. Her stories can be one-sided, but she creates sympathetic characters who come to life for me in ways that few authors can manage. I always find myself wanting to hug the protagonist like my sister or brother. In this book, Sabine could have been my best friend—the one who has suffered so much sadness. Certain passages of this novel actually made me cry; that is how well Patchett creates authentic characters with real emotions. And whether her stories take us to Nebraska or the South American Amazon (State of Wonder), Patchett paints a picture of the environment so clearly that I almost needed a sweater to read the part of this book that takes place in the brutal cold of a Midwestern winter. Ann Patchett is such a wonderful storyteller that I finish each of her books totally spellbound. This book was fantastic and I am thrilled that I chose it as my first Patchett novel. There is so much tenderness in this beautiful story; each character (even the dastardly “villain”) is developed and handled with such care; I didn’t want the story to end because of the people involved. There is sadness here, and secrets and complicated family dynamics and love...and love...and MAGIC. Oh, and of course there’s a rabbit too. Time spent with this book was simply delightful. From the book jacket: Sabine – twenty years a magician’s assistant to her handsome, charming husband – is suddenly a widow. In the wake of his death, she finds he has left a final trick: a false identity and a family allegedly lost in a tragic accident but now revealed as very much alive and well. Named as heirs in his will, they enter Sabine’s life and set her on an adventure of unraveling his secrets, from sunny Los Angeles to the windswept plains of Nebraska, that will work its own sort of magic on her. The first book by Patchett that I read was Bel Canto , and I was struck with how masterfully she portrayed those characters. Once again, I marvel at Patchett’s skill in drawing fully realized characters. Even the deceased – Parsifal, Phan, Albert – are alive in the way they are remembered by Sabine, by Dot, or by Kitty. The story unfolds in bits and pieces, much as it would in real life. You don’t tell everything at once to someone you’ve just met, and likewise Sabine keeps some things to herself in describing her years with Parsifal to his mother, and Dot keeps key bits of information from Sabine in relating Parsifal/Guy’s childhood. In this way, the reader feels the same hesitancy as these characters. And yet, their ultimate decisions seem correct and reasonable, even when relayed as abrupt and hasty. I also really liked how the environment affects their actions. Sabine is a different person in sunny Los Angeles than she is in snowy Nebraska. This morning, my belligerent son used his well-honed fingernails to pierce a hole in my hand, drawing blood. When I felt the pain, I smacked his hand away in self defense. I don't feel like talking to him, or even looking at him, for a week. I think he feels the same. He is six, and he has beautiful eyes. Of course, were he to be diagnosed with brain cancer, my heart would explode and die, and my will to live would wane faster than you could say intentional overdose. Can a person overdose on Advi This morning, my belligerent son used his well-honed fingernails to pierce a hole in my hand, drawing blood. When I felt the pain, I smacked his hand away in self defense. I don't feel like talking to him, or even looking at him, for a week. I think he feels the same. He is six, and he has beautiful eyes. Of course, were he to be diagnosed with brain cancer, my heart would explode and die, and my will to live would wane faster than you could say intentional overdose. Can a person overdose on Advil? It's all I've got in the house. I don't know what I need. Rather, what I want is impossible. What I want is to start over, not just today, but everything. The basics: At the beginning of the novel, Parcifal, the magician of the novel's title, dies suddenly. Sabine, the assistant of the title, is left to grieve. My thoughts: After having loved State of Wonder, Bel Canto, and Run, I was convinced Ann Patchett was one of my literary soul sisters who could do no wrong. Sadly, I didn't connect with The Magician's Assistant at all, and I struggled to even finish the novel. My problems with this novel really begin with Sabine. While I'm normally an empathetic reader, I found myself instead wanting to shake Sabine. She fell in love with Parcifal years ago and worked as his assistant for more than twenty years. Parcifal, however, is gay, and he was in love with Phan, who died of AIDS. Parcifal was also sick with AIDS, and he and Sabine were preparing for his death, but something else killed him. As Sabine is dealing with her grief, I failed to understand her weakness. Her behavior seemed to be that of a teenager or woman in her early twenties. Patchett kept reminding me Sabine was in her forties, and I couldn't help but feel sad for her: she married a man who only loved her as a friend and has nothing else after his death but his money and the money of Phan. As pitiful as Sabine was, I still kept hoping to connect with this novel. When Sabine learns Parcifal's mother is in fact alive and well in Nebraska, she welcomes her and Parcifal's sister when they visit Los Angeles. I hoped the preposterousness of this situation would carry humor and grace, but instead, it just seemed sad and somewhat far-fetched all around. Despite these long-held secrets about Parcifal (his family still knows him as Guy), something always felt off about the people; they never felt real either. There were a few digs at Midwestern life I didn't buy either, but I could have overlooked some of the caricature if I felt the emotional depth I have in Patchett's other works. Favorite passage: "Most people can't be magicians for the same reason they can't be criminals. They have guilty souls. Deception doesn't come naturally. They want to be caught." The verdict: Despite my love of Patchett's writing, I never connected with Sabine in this story, and I never felt truly engaged with the narrative. While her writing excelled, plot and character development were lacking, and overall, this novel left me cold. 1/2/14: Rereading an old favorite is interesting. I still love this book, still love the glittering magic of LA and the gritty, land-bound Nebraska setting. What surprised me was how my perception changed. I loved this book at 19, then at 22, then at 24. Everyone felt so much older then; reading it now, I'm older than the youngest main character in the story, Bertie, and what hit hardest was how this was a story of grown ups not knowing what the hell they're doing and making poor decisions. But 1/2/14: Rereading an old favorite is interesting. I still love this book, still love the glittering magic of LA and the gritty, land-bound Nebraska setting. What surprised me was how my perception changed. I loved this book at 19, then at 22, then at 24. Everyone felt so much older then; reading it now, I'm older than the youngest main character in the story, Bertie, and what hit hardest was how this was a story of grown ups not knowing what the hell they're doing and making poor decisions. But then there are the good decisions, too. And I still remain curious about Sabine. This is never her story, so it's interesting she's the narrator. Part of me thinks that's why I like it so much. Every time I read it, I hope to know more about her. Five stars with reluctance since I couldn't describe what the attraction this book had for me. Whether it was the grass is greener concept or we're all the same, or the draw of magic. The sad life of Sabine moved to a new chapter although she will likely continue to live propelled with other people's direction. I absolutely loved the character of the rabbit who seemed a cross between a cat and dog. In my analysis of this book, I have to remind myself that Patchett had written it prior to her amazing, "Bel Canto" and her most recent, "Run". The latter included flat characterizations,and was filled with implausible coincidences and did not meet my expectations for "suspense", as was publicized. In this novel, Patchett had already demonstrated her talent for fashioning her language to convey the complexities of her characters' emotions and actions. She was so adept at this in "Bel Canto", one In my analysis of this book, I have to remind myself that Patchett had written it prior to her amazing, "Bel Canto" and her most recent, "Run". The latter included flat characterizations,and was filled with implausible coincidences and did not meet my expectations for "suspense", as was publicized. In this novel, Patchett had already demonstrated her talent for fashioning her language to convey the complexities of her characters' emotions and actions. She was so adept at this in "Bel Canto", one could almost hear the music! "The Magician's Assistant" is Sabine, recent widow of Parsifal,a talented, complex magician. Following his death, she discovers that he had a family, the existence of which he had never revealed. In the midst of Sabine's deep grief, she then has to contend with a new aspect of dealing with his absence. Throughout this book, Sabine's grief and sense of loss is poignantly felt. Patchett has written a tender, sad, often symbolic and sometimes humorous tale. Sabine is obviously downcast, but warm and likable. Other characterizations are vivid, varied and, for the most part, engaging. 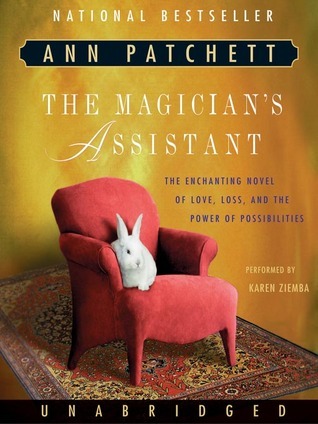 With The Magicians Assistant, Ann Patchett has performed the proverbial "Hat Trick" with a tale that is filled with beautiful writing but contains nothing new in the way of plot. By diverting our attention with conversations with the dead, flashbacks, dreams and vicarious travel being experienced by Sabine, the title character of this piece and widow of Parsifal the Magician, she manages to make us think we are experiencing a tale of substance when, in fact, it is really all just smoke and mirro With The Magicians Assistant, Ann Patchett has performed the proverbial "Hat Trick" with a tale that is filled with beautiful writing but contains nothing new in the way of plot. By diverting our attention with conversations with the dead, flashbacks, dreams and vicarious travel being experienced by Sabine, the title character of this piece and widow of Parsifal the Magician, she manages to make us think we are experiencing a tale of substance when, in fact, it is really all just smoke and mirrors. This story of a woman in love with a man who is in love with a man, as well as the "tragic" childhood experiences and hidden family with a trunkful of secrets are classic Hollywood fodder and not worthy of the woman who gave us Bel Canto and Patron Saint of Liars. This review has been hidden because it contains spoilers. To view it, click here. We meet Sabine as she mourns the death of her husband, Parsifal. The two had partnered on stage in a magic act. But this was not a typical marriage. Although the two loved each other dearly, they did not marry until about a year prior, after a decades long friendship. Parsifal was gay, and was dying of AIDS, the disease that had taken his lover, Phan. When a lawyer comes to Sabine with details of the will, she learns that everything Parsifal had told her about his upbringing was a lie. His mothe We meet Sabine as she mourns the death of her husband, Parsifal. The two had partnered on stage in a magic act. But this was not a typical marriage. Although the two loved each other dearly, they did not marry until about a year prior, after a decades long friendship. Parsifal was gay, and was dying of AIDS, the disease that had taken his lover, Phan. When a lawyer comes to Sabine with details of the will, she learns that everything Parsifal had told her about his upbringing was a lie. His mother and sister come to Los Angeles, meet with Sabine and mourn together. The story is about Sabine looking into Parsifal’s past as a way of getting closer to him, as his mother seeks out Sabine as her way of re-engaging with her lost son. What did Parsifal have to hide? As each secret is revealed, we wonder what will be revealed next. Is Sabine the only Magician’s Assistant here? Parsifal’s sister turns out to have been the original model for that role. What other parallelisms will Pratchett reveal? Although the tale of a secret past revealed is interesting, the action is very deliberate, and I found that I was eager for her to pick up the pace. I cannot say that I seriously considered not finishing the book, but the thought did cross my mind. This review has been hidden because it contains spoilers. To view it, click here. I have read other books by Ann and really liked them, she is a great writer and I will continue to read more by her. The main character in this book is a woman who has been in love with a gay man, the magician to her magician's assistant, for over 20 years. The man and his lover have just died of AIDS and she is left behind in the house the three of them had shared. She is a bit of a pathetic creature, I had to really work sometimes to respect her, even though I think she is intelligent and grie I have read other books by Ann and really liked them, she is a great writer and I will continue to read more by her. The main character in this book is a woman who has been in love with a gay man, the magician to her magician's assistant, for over 20 years. The man and his lover have just died of AIDS and she is left behind in the house the three of them had shared. She is a bit of a pathetic creature, I had to really work sometimes to respect her, even though I think she is intelligent and grieving. I found it sad that she wasn't able to own more of her own life, that she lived so vicariously through her "husband" Parsifal (they got married shortly before he died so she could inherit everything) and his lover Phan. The main character in the book was really Parsifal and you just learn everything about him through her, but she really doesn't have a voice of her own - until maybe the very end. I definitely liked this book, but I feel like if she was my friend I would get very annoyed with her as a person. I found this to be a quick, somewhat compelling read, but it really fell flat for me when there was no good resolution. I expected the ending to be much more significant/meaningful/profound than it was - instead, it felt really empty. I also predicted it about 1/3 of the way through the book, and it played out in a really hollow way, I thought. Probably not worth reading if you haven't already, though it's quick so you could always try it w/out wasting much time. Whew. I've been muddling through 2 and 3 star books for a while; it was quite a relief to find this beautiful specimen. I have State of Wonder on my to read list and was browsing stacks in the library by author and figured I'd pick up something else by Patchett to see what I thought. And I loved it. This book was very compelling, beautifully written, amazingly perceptive, funny, and wise. The characters were complex, the plot unfolded well, and I really only have one very small criticism. I thou Whew. I've been muddling through 2 and 3 star books for a while; it was quite a relief to find this beautiful specimen. I have State of Wonder on my to read list and was browsing stacks in the library by author and figured I'd pick up something else by Patchett to see what I thought. And I loved it. I thought the two boys (How and Guy) were not consistently portrayed. They are supposed to be in 9th and 11th grades (making them roughly 14 and 16) and yet, most of the time they were described (at least emotionally and mentally) as about 9 and 11 (I mean really, they can't just go home after school and be alone, they still need their grandma to babysit them??? ); then, at the very end when Kitty and Sabine are looking through their rooms to pack, Sabine finds a roach on the floor. What? They are smoking pot? When? They are never home alone! On the other hand, the unraveling of the romance between Kitty and Sabine was great. I had it pegged the morning after Sabine's first meeting with Kitty when she comes out into the living room to discuss things with Dot and she just can't stop thinking about Kitty's beautiful face and how much she resembles Parsifal. After just having watched 12th Night at the local Shakespeare theater, I had sibling switcheroo in my head and maybe guessed this sooner than other readers might. Either way, Patchett unfolds it beautifully and it is completely understandable from a psychological perspective. I loved the subtle revelation of Howard's relationship with Kitty. At first I was convinced that he was very abusive (Patchett sets the reader up with Kitty's inability to make dinner on Sabine's arrival) and controlling, but as it developed I understood him to be less abusive in the sense that Albert was abusive and more violent natured. I am not saying he's not a prick and certainly in the last scene with the knife the reader is given a glimpse of the harm he might be capable of inflicting, but he is not just an abusive jerk. He is a complex character; he is a bully with no real self esteem and in his own way is upset at the very real possibility that his wife is actually going to leave him this time. He understand the complexities of the relationship between Kitty and Sabine and feels threatened. I was so pleased that this minor character was not just a stereotype place holder, but also has depth and complex angles. "Having come to find there was no comfort in getting what she wanted, what she wanted now was something else entirely." Great concise quote on human nature. "For twenty-two years Sabine had told her stories to one person, so that the action and the telling had become inseparable. What was left was half a life, the one where she lived it but had nothing later to give shape to the experience." As a new widow, Sabine does not know how to live without having Parsifal there to reflect her own experience back to her. Again, concise and beautiful. "You never told because people wanted so desperately to know. They wanted what you had and therefore what you had was all the power. Who would give that up? What possible benefit could there ever be in telling? A minute of gratitude and then the dull falling away, the boredom that always followed knowledge." Not only true in relation to the revelation of magic tricks, but also the human inability to achieve satisfaction. It goes great as a concept with the first quote above...all that ever happens once you get something (an object, knowledge, or love from the unattainable) is that you find a new thing to want. This was the 5th Ann Patchett novel I've read, but the 2nd of those chronologically. It was...interesting. *She's lived in Los Angeles most of her life. *She could have been an architect, but instead she makes architectural models. *She's been a magician's assistant for over 20 years. *She was in love with Parsifal, the gay magician (who was also quite wealthy from his successful rug stores). *Parsifal and his This was the 5th Ann Patchett novel I've read, but the 2nd of those chronologically. It was...interesting. *Parsifal and his even more wealthy partner had AIDS. His partner died first, then Parsifal married Sabine so that she would inherit all his stuff. Then he suddenly died, actually not from AIDS-related complications at all. *Parsifal claimed that he was from the east coast and that his family was all killed in a car accident when he was in college. *Parsifal was actually named Guy, was from Nebraska, and his mother and two sisters are very much alive...and want to meet Sabine. (hide spoiler)] that's not really a spoiler. So, boom. Where does Ms. Patchett go from there? There are still several secrets to be revealed, lots of family drama, and...there's Nebraska. And this is not Rainbow Rowell's quirky, but kind of hip, Nebraska. This is small town, white bread, 1990s Nebraska, as seen from the point of view of an author and a main character who have spent their lives in LA. I'm not saying there's not some truth in the portrayal, but it sometimes feels condescending. Went down like pablum. Bland, but healthy, just like a Hallmark movie. Everyone is good and wonderful and life affirming except for a couple of domestic abuser men. Sabine’s magician husband, Parsifal, has just died at the beginning of this story. It soon becomes clear that she has loved him for the 20 years that she has served as his assistant on stage, despite knowing he was gay. She lived with Parsifal and his lover for a long time in LA and only married him recently as his prolonged illness Went down like pablum. Bland, but healthy, just like a Hallmark movie. Everyone is good and wonderful and life affirming except for a couple of domestic abuser men. Sabine’s magician husband, Parsifal, has just died at the beginning of this story. It soon becomes clear that she has loved him for the 20 years that she has served as his assistant on stage, despite knowing he was gay. She lived with Parsifal and his lover for a long time in LA and only married him recently as his prolonged illness became worse. This story I would have liked to learn a lot more about. By what miracle could such a relationship work? Instead, the story focuses on her grief. After Parsifal’s death she learns he has a family in Nebraska she never knew about. She spends most of the book coming to terms with a dark secret from Parsifal’s youth and sharing her love and grief over losing him with the family he tried to forget. The story is touching, and the characters are well drawn. But I didn’t laugh and I didn’t cry. I didn’t gain detectable wisdom about being human. And I wasn’t struck enough by the prose to consider writing some passages down. This is the first book by Ann Patchett I've ever read. It won't be my last. For 20 years Sabine has been the assistant to the brilliant magician, Parsifal, with whom she has also been obsessively in love. But Parsifal is gay, and his lover, Phan, is part of this trio of characters. Unsavory as this may sound, it seems to work well for them. Then Phan dies -- Parsifal, feeling his own death is nearing -- marries Sabine so that she can inherit his and Phan's estates. But, once she's a widow, the gri This is the first book by Ann Patchett I've ever read. It won't be my last. Then Phan dies -- Parsifal, feeling his own death is nearing -- marries Sabine so that she can inherit his and Phan's estates. But, once she's a widow, the grieving Sabine begins to make all sorts of startling discoveries about the magician whom she thought she knew so thoroughly, and about herself as well. Maybe I am biased when it comes to Ann Patchett but I just loved loved loved this book. Wonderful story about Sabina who is wife, partner and friend for more than 20 years to Parsifal, a magician. After Parsifal dies Sabine finds out that he has a Mother, two sisters and two nephews living in Nebraska that she never knew anything about. The book is about love and relationships, family, magic, secrets and friendship. So beautifully written, just loved it highly recommend. I truly love Ann Patchett's writing. Her characters are deep and raw and flawed and so human. They are so well presented and developed so that by the end I have a clear vision of who they are...even if they don't know have such a clear view of themselves. I love love loved the characters and they made this book so good. This book was such a beautiful and emotion description of deep grief from different point of views. The inside of Sabine's mind was an interesting place to be and I enjoyed learnin I truly love Ann Patchett's writing. Her characters are deep and raw and flawed and so human. They are so well presented and developed so that by the end I have a clear vision of who they are...even if they don't know have such a clear view of themselves. This book was such a beautiful and emotion description of deep grief from different point of views. The inside of Sabine's mind was an interesting place to be and I enjoyed learning about Percifal from her memories combined with his family's. I've had this on the bookshelf for a very long time. All of my friends rave about Patchett's 'Bel Canto', which is also waiting on the shelf. What's kept me from reading them is my experience reading 'Run' by this author. I read it with my book group and just didn't care for it, because of that I'd been putting off reading her books. I'm happy to say this book remedied my aversion to reading Ann Patchett novels. Sabine is the magician's assistant, her husband, Parsifal, the magician, has just pas I've had this on the bookshelf for a very long time. All of my friends rave about Patchett's 'Bel Canto', which is also waiting on the shelf. What's kept me from reading them is my experience reading 'Run' by this author. I read it with my book group and just didn't care for it, because of that I'd been putting off reading her books. I'm happy to say this book remedied my aversion to reading Ann Patchett novels. Sabine is the magician's assistant, her husband, Parsifal, the magician, has just passed away. During the course of settling his estate Sabine discovers Parsifal's mother and sister, whom she thought had been dead for the last 25, or so years, are actually very much alive. She feels she must let them know Parsifal has died. When she reaches out to them their mutual love for Parsifal sparks an unexpected relationship. I really enjoyed this story, there was a real sweetness to the character's and the author does a wonderful job describing the love and devotion they felt for one another. I liked the way she brought a magical (and psychic) element to the story through the dreams Sabine has about her friend Phan who also recently passed away. In addition to the affection these characters have for one another they also feel a deep disappointment and sense of loss for relationships that might have been different, words that went unsaid and things that might not have happened. The overall feeling of the book is one of looking back and remembering with regret and remorse but also with love and adoration. I thought it was a funny coincidence that I picked this book up while I was reading 'Parzival: The Quest of the Grail Knight' by Katherine Paterson. Sad that I didn't make the connection between the two until Sabine explained how Parsifal chose his name (from Sir Parzival). Sabine's pet bunny "Rabbit" weighing in at just under 20 pounds, further endeared me to the story as we just adopted our own bunny. This is a warm and very human story. I loved getting to know the main character, Sabine, and watching her come to terms with the choices she's made as she struggles to build a new life after losing her magician. All the characters in this story are so multi-dimensional that I found myself simply engaging with them at a human level and losing the critical distance I usually maintain when I read fiction. My only real complaint with the novel involves the pacing. Some of the narrative changes were This is a warm and very human story. I loved getting to know the main character, Sabine, and watching her come to terms with the choices she's made as she struggles to build a new life after losing her magician. All the characters in this story are so multi-dimensional that I found myself simply engaging with them at a human level and losing the critical distance I usually maintain when I read fiction. My only real complaint with the novel involves the pacing. Some of the narrative changes were a bit abrupt and, on the other hand, the Nebraska sections drag on with lots of detail about Walmart and kitchens tables, but overall the novel is very satisfying. Absolutely terrible. Hard to believe it's the same Ann Patchett who wrote such masterpieces as 'Bel Canto,' 'Commonwealth' and 'State of Wonder.' It's unfortunate, too, because the premise was such a promising one: a woman loses her husband and learns more about him in death than she ever did in life. But I found myself painfully bored by Sabine's journey; even the few unexpected things she discovers about her husband are only minimally revelatory. Perhaps more surprising is the absence of that Absolutely terrible. Hard to believe it's the same Ann Patchett who wrote such masterpieces as 'Bel Canto,' 'Commonwealth' and 'State of Wonder.' It's unfortunate, too, because the premise was such a promising one: a woman loses her husband and learns more about him in death than she ever did in life. But I found myself painfully bored by Sabine's journey; even the few unexpected things she discovers about her husband are only minimally revelatory. Perhaps more surprising is the absence of that exquisite writing for which Patchett has long been known -- and because of it, the novel was much harder to get through and even more uninspiring. My favorite Ann Patchett book I've read since Run. I prefer it to Commonwealth, which seems a bit off balance, maybe because of the autobiographical elements. The premise is rich and I'm really sad to leave these characters. Took me a little while to like it, but I was definitely a fan by the end. Patchett was born in Los Angeles, California. Her mother is the novelist Jeanne Ray. She moved to Nashville, Tennessee when she was six, where she continues to live. Patchett said she loves her home in Nashville with her doctor husband and dog. If asked if she could go any place, that place would always be home. "Home is ...the stable window that opens out into the imagination." Patchett attended hi Patchett was born in Los Angeles, California. Her mother is the novelist Jeanne Ray. Patchett attended high school at St. Bernard Academy, a private, non-parochial Catholic school for girls run by the Sisters of Mercy. Following graduation, she attended Sarah Lawrence College and took fiction writing classes with Allan Gurganus, Russell Banks, and Grace Paley. She later attended the Iowa Writers' Workshop at the University of Iowa and the Fine Arts Work Center in Provincetown, Massachusetts, where she met longtime friend Elizabeth McCracken. It was also there that she wrote her first novel, The Patron Saint of Liars. In 2010, when she found that her hometown of Nashville no longer had a good book store, she co-founded Parnassus Books with Karen Hayes; the store opened in November 2011. In 2012, Patchett was on the Time 100 list of most influential people in the world by TIME magazine.